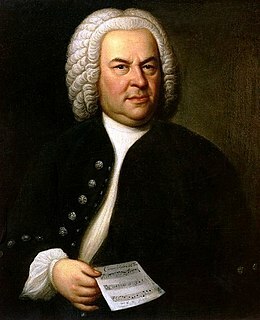 'S e cumadair-ciùil Gearmailteach a bh' ann an Johann Sebastian Bach. Rugadh e ann an Eisenach air am 21mh latha den Mhàrt, 1685, ann an teaghlach làn luchd-ciùil. Sgrìobh e a chuid mhòr den cheòl aige airson na h-eaglaise ach chan eil sgeul air mòran dhiubh. A bharrachd air sin sgrìobh e ceòl airson na h-ionnsramaidean fìdheall, beus-fhìdheall, organ, cruit-chòrda agus clabhchòrd. Airson orcastra, mar eisimpleir, tha e na ùghdar de na sia concerti ainmeil Brandenburg. Phòs è dà thuras agus bha mu fhichead chlann aige - le feadhainn aca nan neach-ciùil cuideachd. Bhàsaich e air an 28mh latha den t-Iuchar 1750 ann an Leipzig. Ged a bhàsaich e mun cuairt air dà cheud 'sa caogad bliadhna tha an ceòl aige cho cumhachdach agus coiteanta 'san latha an-diugh 'sa bha e a-riamh. Cha robh e ro ainmeil nuair a bha e beò ach 's e aon de na ùghdaran ciùil as iomraiteach san t-saoghal a th' ann a-nis. Air a tharraing à "https://gd.wikipedia.org/w/index.php?title=Johann_Sebastian_Bach&oldid=541411"
Chaidh an duilleag seo a dheasachadh 21 dhen Mhàrt 2018 aig 21:26 turas mu dheireadh.